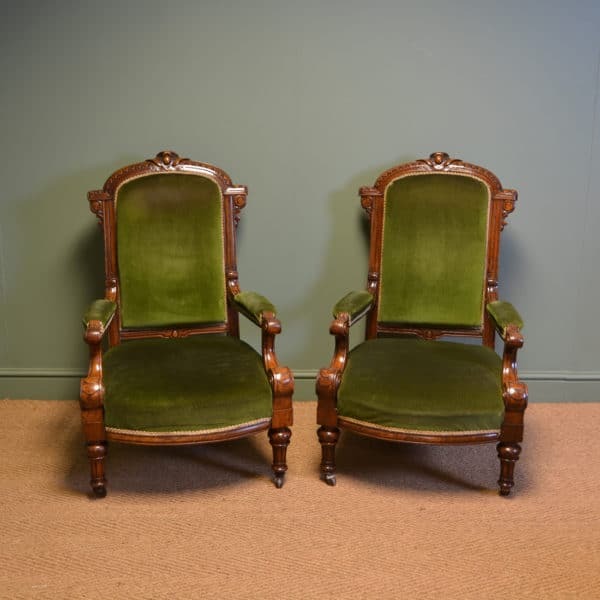 Antique Victorian Chairs were constructed throughout Queen Victoria’s reign of 1837 to 1901. The Victorian Cabinet maker was always on the search for new designs and although this led to new features like the balloon back chair, ironically it also led to the revival of 18th century designs like Chippendale or Gothic revival. 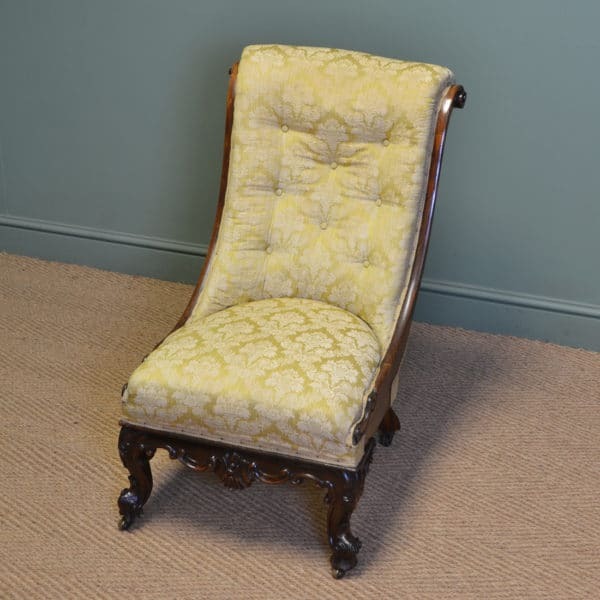 Comfort was the main focus in the Victorian era, with upholstery being used in a larger scale along with buttoned backs and loose comfortable cushions. The Victorian cabinet maker was just as good as their predecessors in cabinet making with high quality timbers used but they made their designs more lighter and delicate. 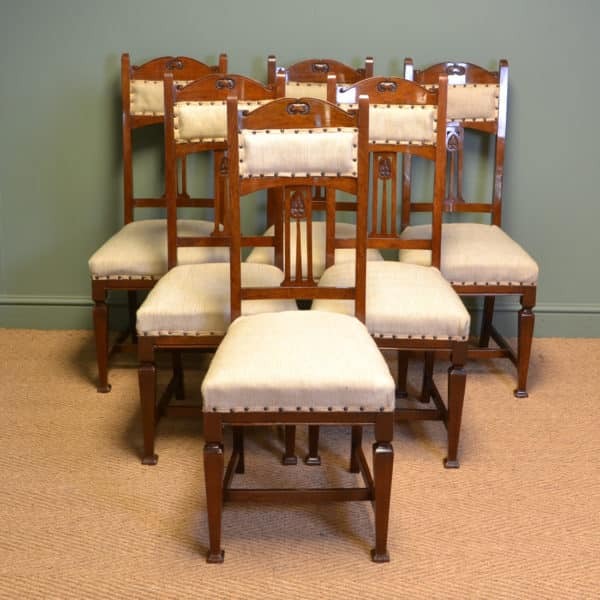 Dining was a big part of the Victorian lifestyle so Victorian dining chairs were made from a standard set of six up to longer sets of twelve and Mahogany, Oak and Walnut was widely used in their construction. 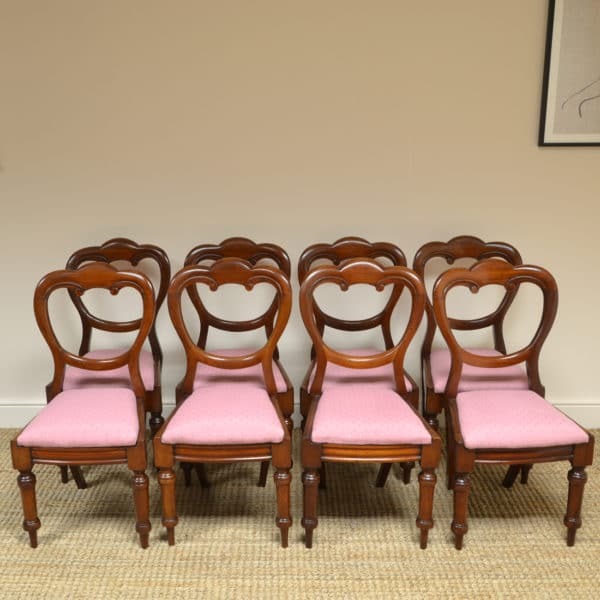 Victorian chairs are usually very solidly built with turned legs and shapely backs, they are one of the most sort after periods of antique chairs, due to comfort, quality and good designs. Have a look below at our lovely examples available for sale. 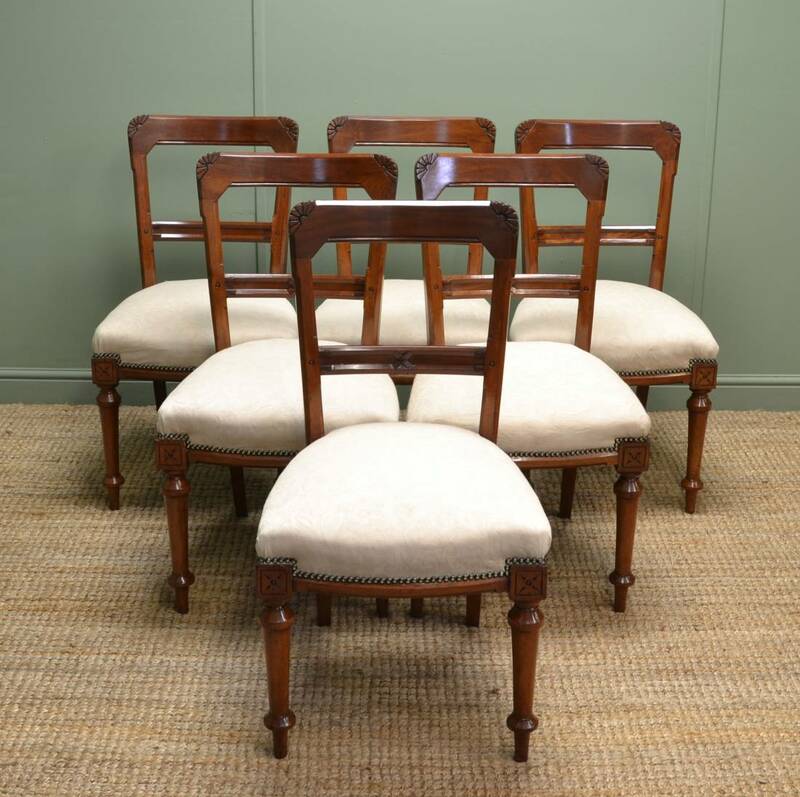 Country House Set of Eight Victorian Oak Balloon Back Antique Dining Chairs by James Winter & Sons. 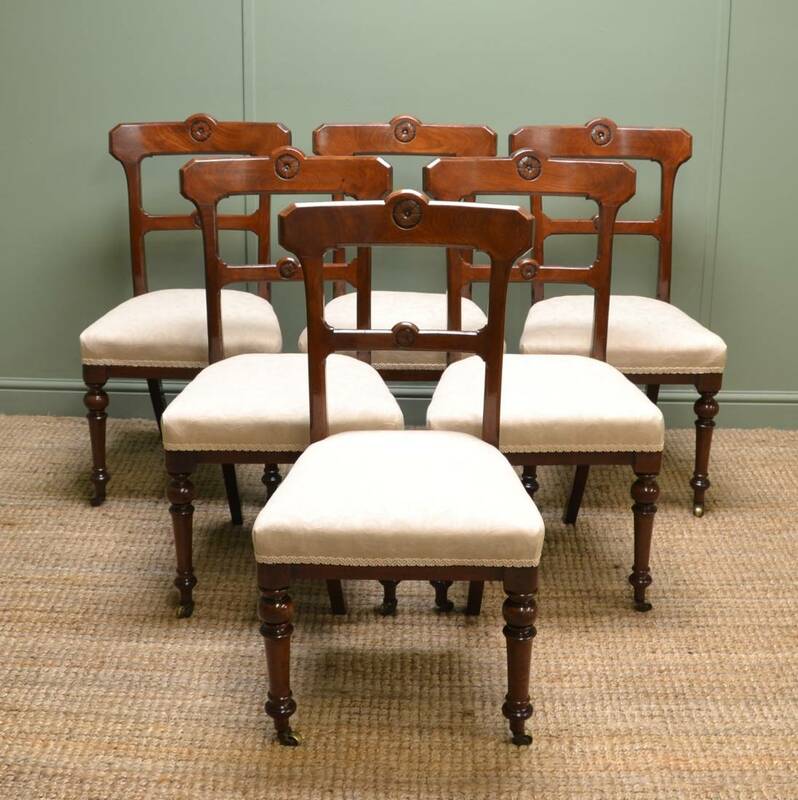 below are examples of previously sold Victorian chairs, let us know if any particular style looks suitable and we can try to find a set similar. 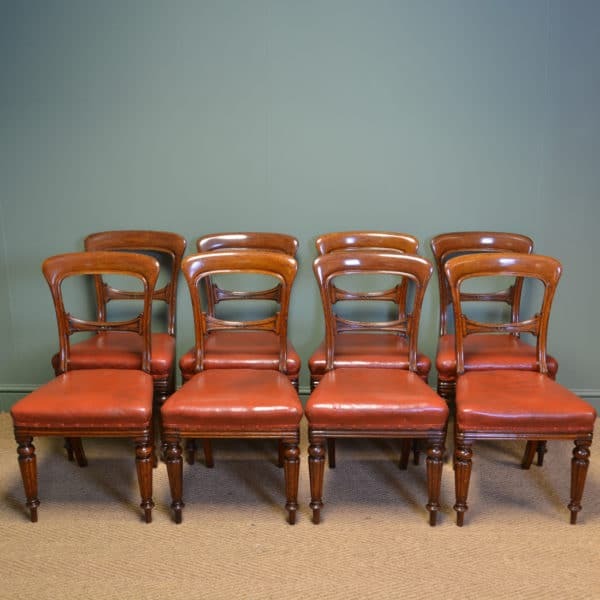 Set of Six Quality Victorian Mahogany Antique Dining Chairs by Roodhouse of Leeds. 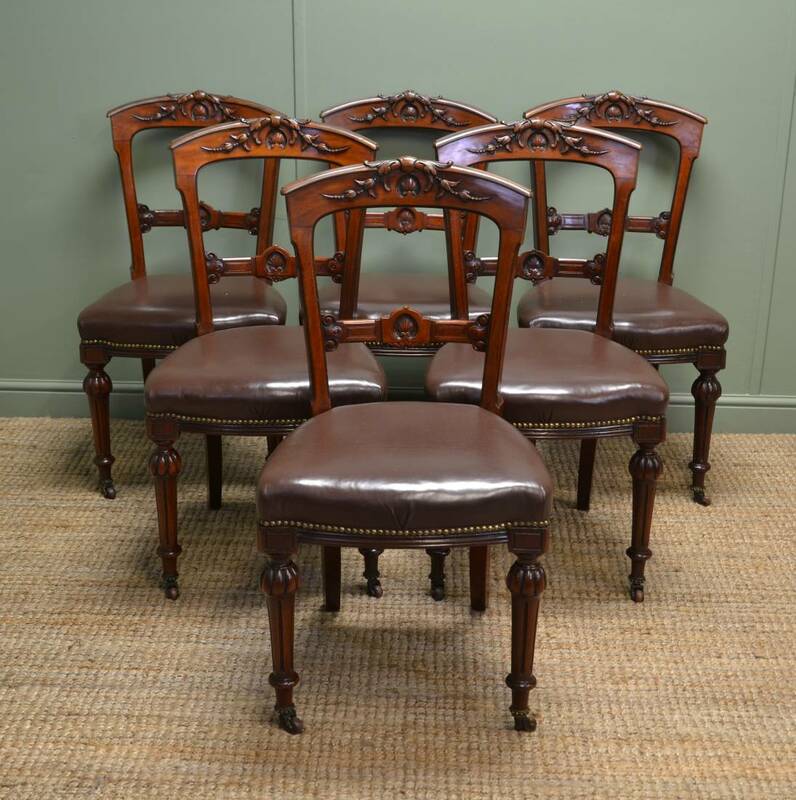 This quality set of six antique mahogany dining chairs date from April 1889, they still display their makers label ‘Roodhouse of Leeds’ along with the actual cabinet makers signature. 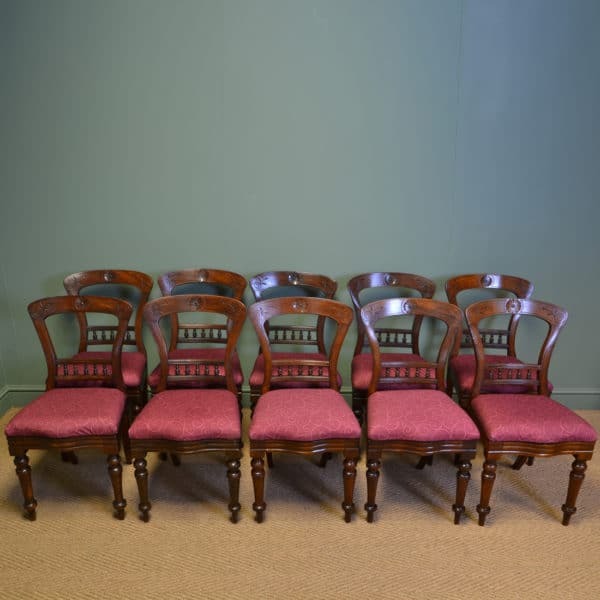 Superb Quality Set of Six Victorian Antique Walnut Dining Chairs, Dating from around 1870 in the Victorian period. 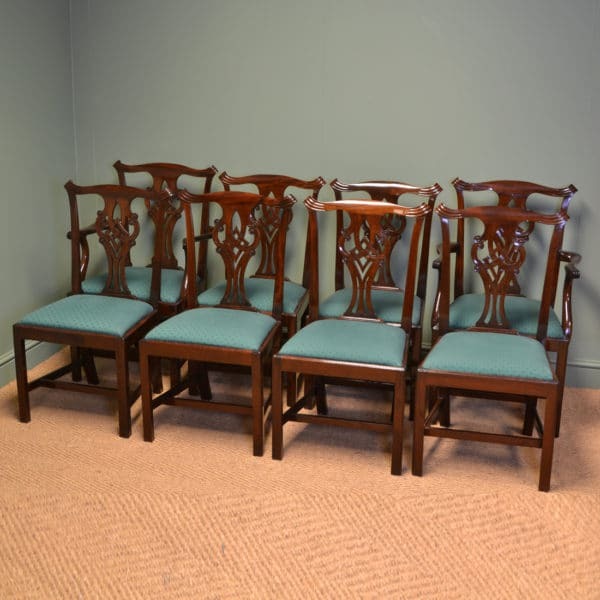 Set of Six Antique Victorian Arts & Crafts Walnut Dining Chairs, in a true Arts & Crafts style, made from walnut and still retain the original makers label T Simpson & Son from Halifax which also includes the cabinet makers signature. 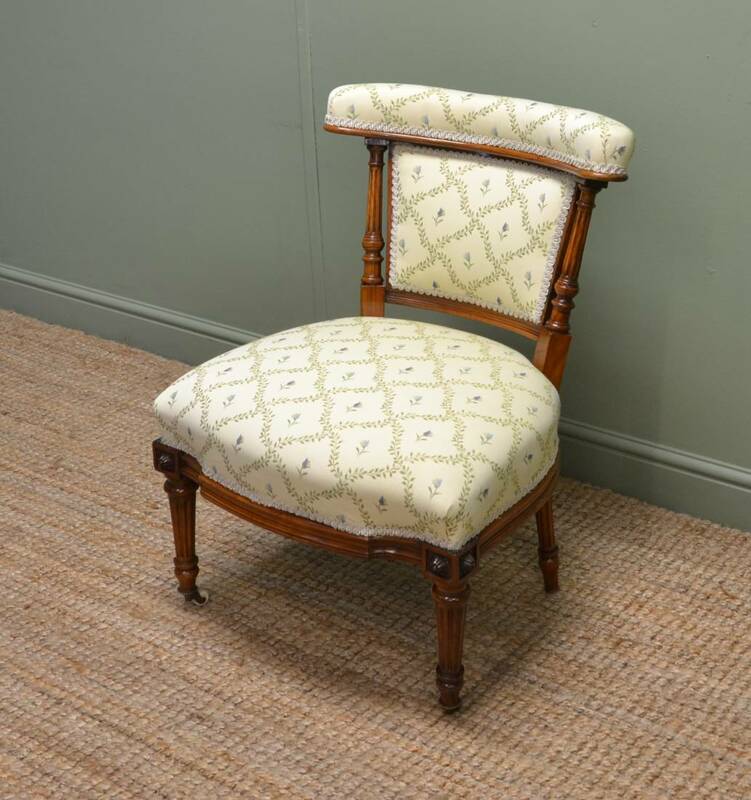 This delightful small antique upholstered chair dates from the Victorian period, circa 1880, is of superb quality and constructed from the finest quality walnut timbers. 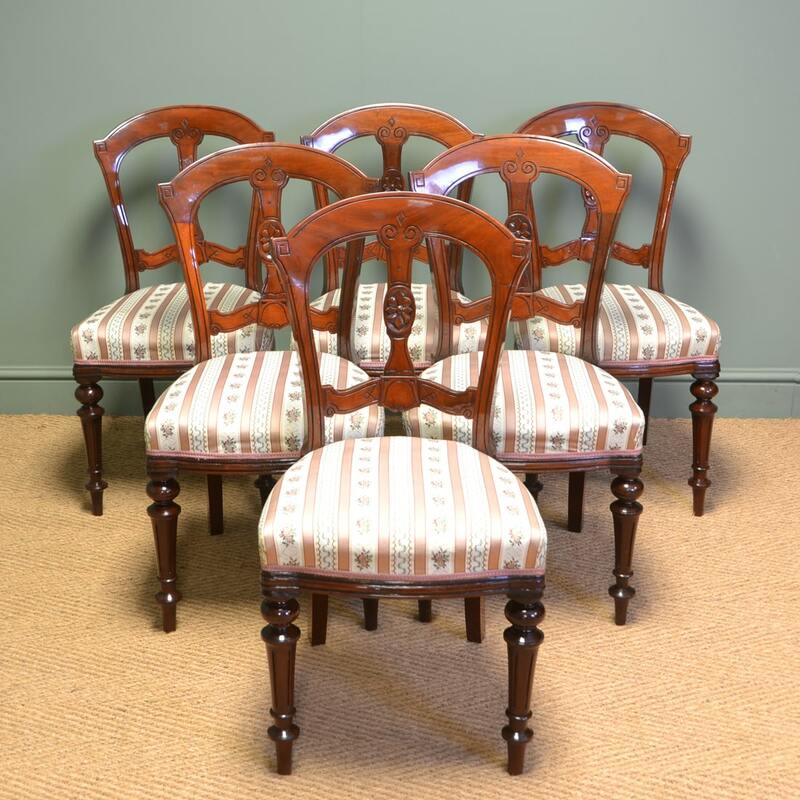 It has a curved back with beautifully turned reeded upright supports. The moulded shaped base displays small floral carved designs and is supported by four beautifully turned reeded legs finished with brass castors and white porcelain wheels. The chair has been very recently upholstered to an extremely high standard as justified by the quality of chair. Victorian Upholstered Antique Mahogany Nursing Chair. 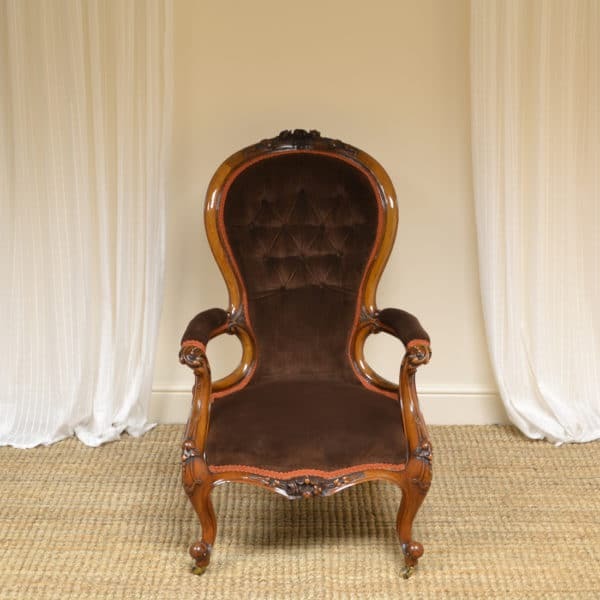 Dating from around 1890 in the Victorian period this upholstered antique nursing chair is constructed from mahogany. It has a scrolled shaped frame with splayed back legs and beautifully turned front legs these being finished with white porcelain castors. 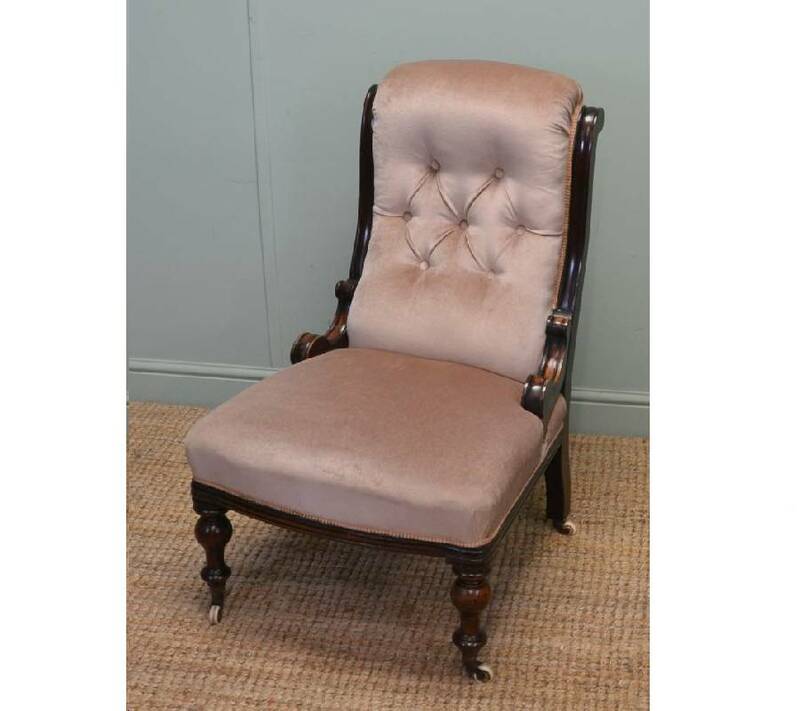 The chair is covered in a dusky pink upholstery fabric having a buttoned back and matching braid trim, all in good condition. 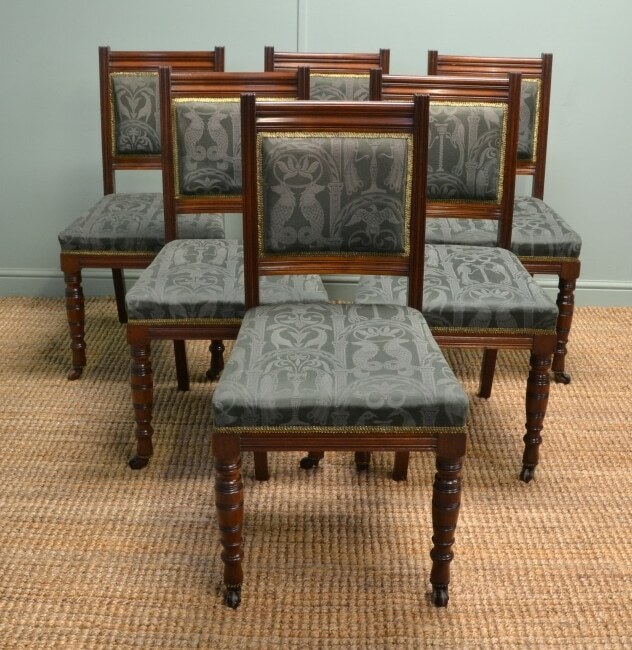 This rare set of eight walnut antique dining chairs are of superb quality and by the renowned cabinet makers A Blain Liverpool . They have even been seen on location in Coronation Street! 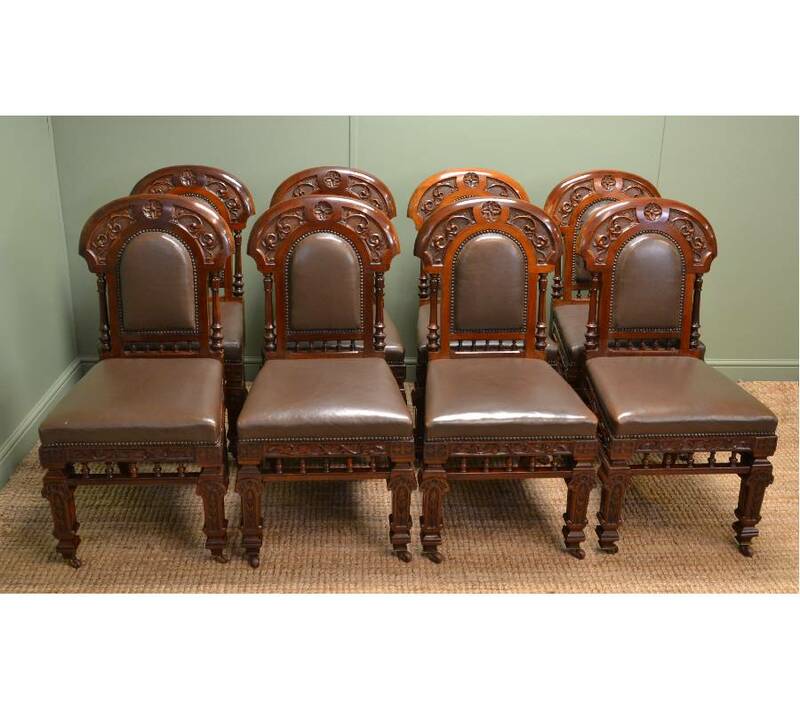 The chairs have unusual curved backs with quality floral and leaf carvings along with turned upright supports and lower turned gallery. They stand on splayed back legs with quality carved front legs along with decorative apron. The chairs are upholstered, both on the back and seat, in a brown leather which is in good condition and finished with a stud trim. One chair does have an old repair, which does not distract from its striking looks, but is still very sturdy and good for everyday use. 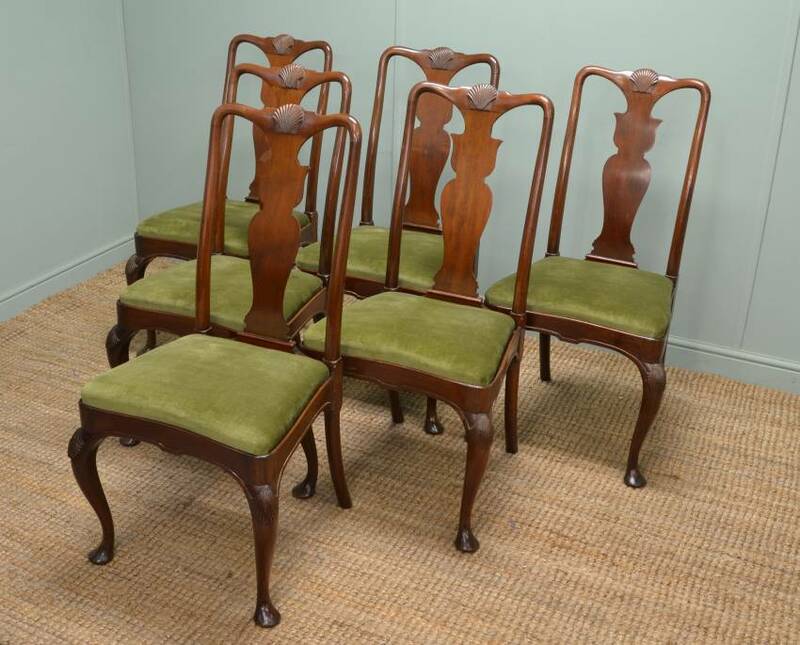 This beautiful set of six Victorian walnut antique dining chairs date from the early part of the Arts and Crafts movement, circa 1880. They have curved shaped backs with central carved motifs and stand on turned front legs with brass castors while the back legs are splayed. The seats have been recently reupholstered in a cream neutral fabric with braid trim. 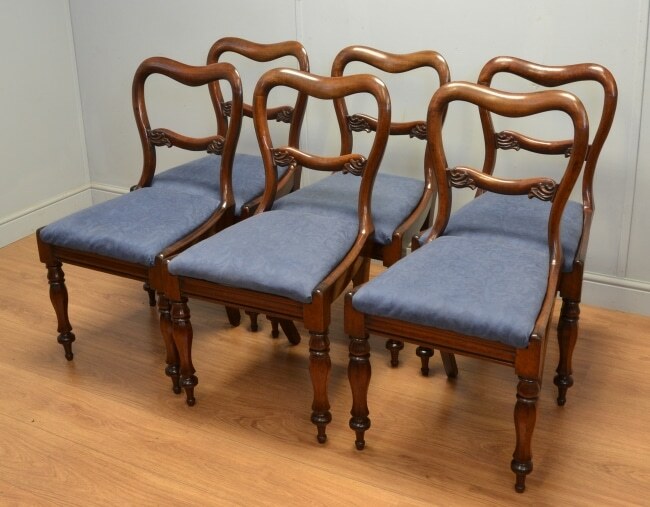 Dating from around 1890 in the Victorian period this set of six antique Victorian chairs have balloon backs which are ornately carved. 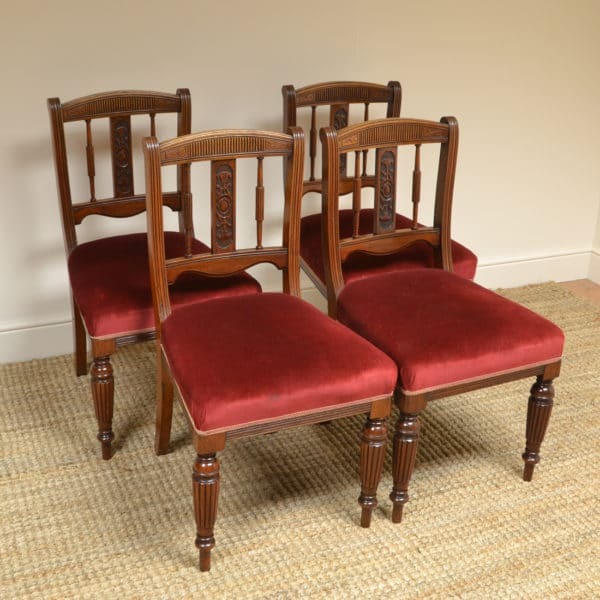 The decoratively carved backs sit above splayed rear legs and cabriole front legs. The seats are covered in a red upholstery fabric, good to go, and finished with a brass stud trim. 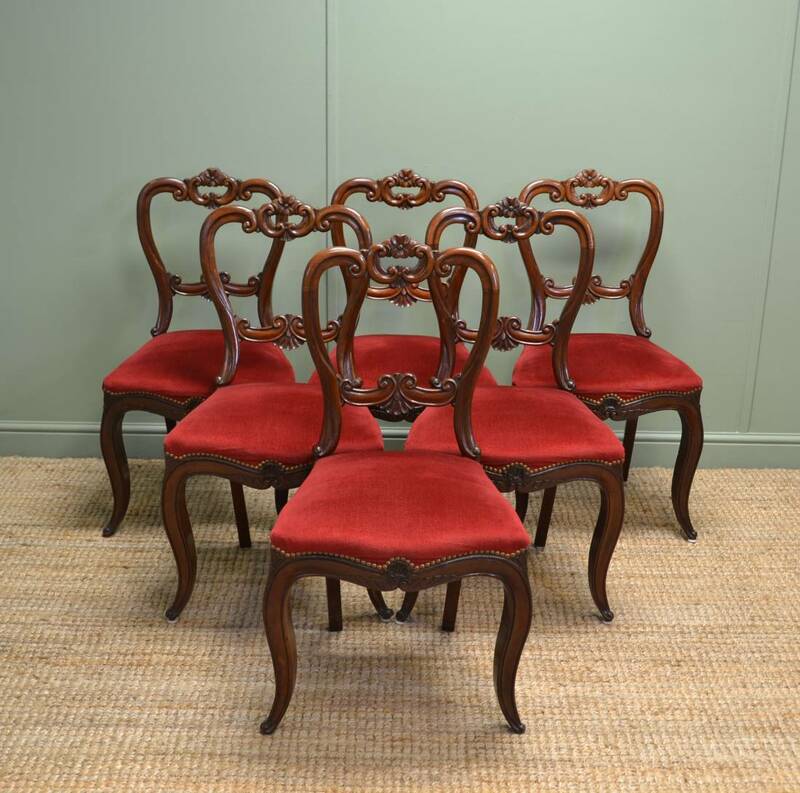 The serpentine front edge of each seat adds to the opulent look, typical of the Victorian period.